Your Home For The Xlerator Hand Dryer And Palmer Hand Dryer! We Stock Only The Best For Your Automatic Hand Dryer Needs! Our Commercial Hand Dryer Solution Helps Reduce Waste And Keeps Your Bathroom Cleaner. 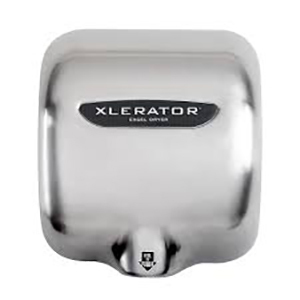 Order Your Xlerator Hand Dryer Today And Get FREE SHIPPING On All Orders Over $50. Shop our selection of the best electric hand dryers from Palmer Fixture and Excel. These automatic hand dryers eliminate the need of a paper towel dispenser, paper towels and excess waste management, all while providing a more convenient and hygienic solution to your staff and customers. Upgrade your commercial bathroom today, with sensor activated hand dryers. You will note that paper towels can be very expensive. Initially, most homeowners and business owners tend to invest more on paper towels per year than what it would cost for an installation of an automatic hand dryer. This used to be very costly; however, with the introduction of automatic hand dryers, the economic cost for basic restroom operations has greatly reduced. Poor hygiene can lead to infections and other unsanitary conditions in your home or business bathrooms. With used paper towels, you are likely to spread more infections (like influenza) than when you are using an automatic hand dryer. Touch free hand dryers can help reduce the spread of communicable diseases, making your environment more safe and sanitary for employees and customers. If you normally use paper towel to dry your hands, you may see a level of inconvenience in the day to day operations of your bathroom. Being able to no longer worry about stocking the restroom with paper towels gives you additional piece of mind and helps employees focus more on customer satisfaction and less on tedious tasks like stocking paper towels. Customers also find automatic hand dryers more conveinent due to the fact that many hand dryers provide a quick way to dry hands without having to touch anything. will note that the vehicles that will transport paper towels from time to time will often emit carbon dioxide when traveling and can have adverse effects on the environment. With automatic hand dryers, the amount of wasted paper products is drastically reduced and provides a level conservation on our natural resources.